I always end up quitting the world I am on. I am going to take a much more simple approach, and just build a castle. If you have any ideas on exact blueprints or ideas in general, please tell us. I have a simple idea of what I could do, but I bet people could get much better designs. Oh, and by castle I mean like a towerish place made out of cobblestone and walls. With a courtyard, well preferably. Oh, I get it, like the spoungebob episode that had the box. Just a general square castle with a large wall around it with towers at regular intervals along the wall is always nice. Go on youtube and check that out. Yeah, in PvP it's best to make special bases. Like underground, remote, you know. Secretive or impossible to get to. I actually kind of like it. I might close up the sides or something and fix it up and put a big ol' tower as a main base to the right...thanks for the help with brainstorming. How big will it be? Will you be able to handle a big project? Is it going to be practical or just for looks? Is it going to be square? Or based on a real castle? See how it isn't perfectly square, and how I have used different materials to other people. You're kidding. You linked to your hard drive. Your hard drive isn't attached to the internet in any way unless it's something like Dropbox. I think you need to take an introduction to computers class. Omfg this is funny ****. Maybe instead of insulting him, you could help him. To upload screenshots so that other people can see them on a message board, go to a site such as Imgur or Filesmelt and upload a file by navigating to the place where you saved your screenshot, copy and paste the link to your uploaded screenshot, and add the tags [SIMG] and [/SIMG] at the beginning and end respectively. Cool name. + 10 character points. This is my fourth castle, which I built on the "World in the Air" seed. They get a little bit more elaborate each time, as I expand on things that I liked in the previous design. 1. Do your floor plan on graph paper or Excel before you start building. 2. Make your floors two layers thick, so you can put down flooring and it won't show through to the room below. 3. Pick the most scenic spot you can find. You don't want to look out on blandness. 4. For your parapets, where you have that notched, toothy thing going on, in the low spots, instead of solid blocks, use stone stairs facing outward. It will enhance your downward visibility quite a bit. Drink it up man that's the taste o' failure! I am new to uploading videos and images so this isn't exactly my strong point. Nice castle dude. Hope it in single player cuz in multiplayer I have noticed that, at least with me, wooden buildings are torched instead of being mined out in some instances. I've personally built a legit castle in single player some months ago, and recently began work on a second one on the very same map. I have also started, but not completed, 3 other castles on friends' servers, so I think I can say I know a thing or two about castle building. My first castle was pretty much a large square with towers, typical castle parapets, and a small lava moat in between a river at the entrance. I also had a watchtower. This castle taught me a lot of things though, mainly that a plain square was a bland design. After I saw this, I set out to create a similar castle. It is almost complete. 1: Get stone. A lot of stone. It requires more than you think. What I do is mine about 6-7 stacks, build, then go back to mining. This way I don't get bored. 2: Be creative. Like I said before, don't make it a bland design. An idea I find interesting is a castle carved into a mountain. I will be working on this after I finish my current castle. 3: Search for castle pictures to get ideas, and mix the ideas you find best. For example, you might find a castle with a balcony but no towers, but a castle with towers but no balcony. Why not make both?! 4: Be patient. Castle building takes a very long time. I don't work for long periods in one time, so my castles take months to complete. I work for an hour or two every couple of days, sometimes even less. Even if you work faster, it will still take a considerable amount of time. 5: Build it near a scenic location. This is pretty obvious; you're going to want a nice view. 6: Come up with a flag for your castle! I haven't seen anyone else do this yet, but I personally love this. It creates a sense of attachment and unity. 7: Don't get frustrated if you make mistakes! For every castle I build, I probably break as many blocks as I place. (Okay, maybe not that much, but you get the idea). You will make mistakes and have to edit/remove them. It's a normal part of building large projects such as castles. 8: Don't rush! Take your time to make your castle as good as it can be. Try not to take shortcuts that make your castle look incomplete or that require less resources. Stone is practically infinite. When you're done, you're going to want your castle to look like the best it can be, not a half-assed stone structure! 9: This probably should have been at the top of the list, but plan before you build. This saves a lot of time and frustration. Before you build, simply sketch a small blueprint or something so you know what you're going for. 10: Start with the easier parts. Don't make a tower before you even make the platform for it! Start with the basic, easy things to build before you move on to the more complex parts. Ideas will just flow in once you have the essentials, and you may even change your thoughts and make more than what you thought you would! 11: Stick to the project. If you find later on in constructing the castle that you wanted your castle to turn out differently, and it is not easily correctible, don't worry. Finish the castle, and then gather up your ideas for the next castle. You also learn and get more castle-building experience (lol) this way. and finally, 12: Have fun! When you finish your castle, you're going to want to remember the sweat and tears you poured into your creation positively. Artuskan, could I have the download file for your latest castle of that design? I really like it! For a Simple Castle for Protection use Cobblestone and do a 10x10 cast 4-5 blocks high. IF your not on a survival world and your doing there really is no telling you what you can do cause there choices are limitless. 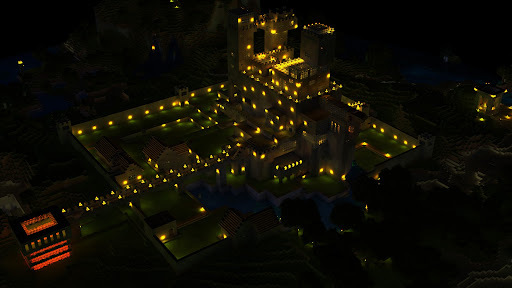 I have Screenshots of my Castles email me at ( [email protected] ) and I will send you a couple of them.